UX research must sometimes seek answers to high-level, strategic questions and elicit generative insights…. It can be challenging to provide a deliverable that effectively communicates our results and facilitates both innovative creativity and tactical decision making. Over the last couple decades, the works of Clayton Christensen, Stephen Wunker, Jessica Wattman, David Farber, Anthony Ulwick, and others who have written about the Jobs to Be Done (JTBD) framework have had considerable influence on the direction of UX research. For example, the Home Depot online UX research team has derived many benefits from applying the JTBD framework in presenting research findings to our Design, Development, and Product stakeholders. Usability studies often provide tactical data that our colleagues can grasp with little explanation. For example, participants preferred or clicked Button A more than Button B—or Button A correlated with other desired behaviors. However, our UX research must sometimes seek answers to high-level, strategic questions and elicit generative insights—for example, how do online consumers shop for time-sensitive products? It can be challenging to provide a deliverable that effectively communicates our results and facilitates both innovative creativity and tactical decision making. Connecting high-level information with a tactical recipe for creating an optimal experience may require thinking through several layers of abstraction. Sharing the findings of generative research using the JTBD framework, ... provides a platform for innovation and data-inspired creativity. For example, it’s useful to know that moviegoers like action movies with moments of comedic relief. However, the knowledge that 70% of baby boomers laugh at secondary male characters getting a pie in the face at the end of a tense chase scene won’t guarantee a successful summer blockbuster. Taking the tools at one’s disposal and learning how to create an audience-pleasing experience with the available cast, plot, script, and budget requires thoughtful consideration of consumers’ thought processes and behaviors. This lets you develop an empathetic understanding that increases confidence in objective decision making. The delivery of in-depth information in the right way allows a director to be truly innovative. This is the kind of value we’ve found in sharing the findings of generative research using the JTBD framework, which provides a platform for innovation and data-inspired creativity. Its vocabulary helps cut through layers of abstraction to identify critical takeaway concepts for the recipients of our research. What is unique about using the JTBD formula is the targeting of experiences that lead to desirable changes in users’ behavior by focusing on their ultimate, desired outcome—the job to be done! The principles underlying JTBD are hardly new. The goal of most UX research professionals is to increase empathy through empirical observation—thus, they praise the use of empirical measurements. What is unique about using the JTBD formula is the targeting of experiences that lead to desirable changes in users’ behavior by focusing on their ultimate, desired outcome—the job to be done! This formula is best expressed through the JTBD research artifact called a jobs atlas, which comprises four critical sections: “Jobs Drivers,” “Current Behaviors,” “Painpoints, Obstacles, and Opportunities,” and “Success Criteria.” These sections integrate many concepts from the fields of usability and psychology and position them through clearly defined relationships. In one sense, JTBD repackages elements of cognitive decision-making theory for easier consumption. 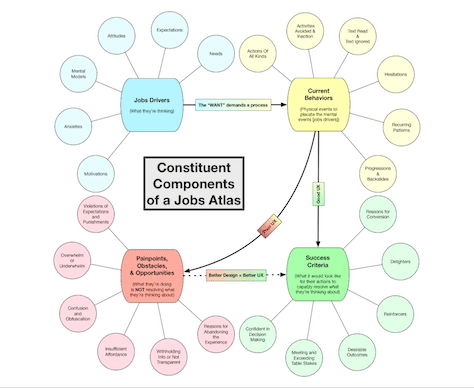 The “Jobs Drivers” section of the jobs atlas includes everything that influences or forms the cognitive strategies relating to the experience you’re studying. As Figure 1 shows, jobs drivers include motivations, needs, anxieties, expectations, attitudes, and mental models—all of the semantics that usability professionals have debated over the years to describe what users are thinking. This section pulls all of these elements into a single collection of jobs drivers. What is truly relevant about these concepts is that they provide context for why it’s desirable to get a job done in the first place. They define and refine the conscious want from the consumer’s perspective. These are the physical operations users attempted in the hope they would lead to satisfying the demands of the jobs drivers. The “Current Behaviors” section of the jobs atlas summarizes all the different kinds of user actions that are currently taking place, which are shown in Figure 2. Just as the “Jobs Drivers” section includes all of the mental elements, “Current Behaviors” contains all of the physical elements. These are the patterns of inclination that we’ve observed in the sampled data, then reported. These are the buttons the user clicked, the content the user read, the buttons or content the user ignored, and so on. These are the physical operations users attempted in the hope they would lead to satisfying the demands of the jobs drivers. These are all the reasons the current behaviors are not effectively meeting the users’ demands, as shown in Figure 3. They describe the undesirable experiences users have encountered among those in the “Current Behaviors” section and provide suggestions that consumers and researchers have offered that present opportunities for improvements. Success criteria describe the end states, or outcomes, the consumer is looking for when engaging in current behaviors in the hope of satisfying their jobs drivers. As shown in Figure 4, the success criteria describe the end states, or outcomes, the consumer is looking for when engaging in current behaviors in the hope of satisfying their jobs drivers. Success criteria define what is a desirable experience from the perspective of your consumers. Painpoints and obstacles prevent the consumer from experiencing success. The more your solutions meet or exceed the success criteria, the more likely the user population is to change their behaviors in ways that meet your goals as the experience owner. 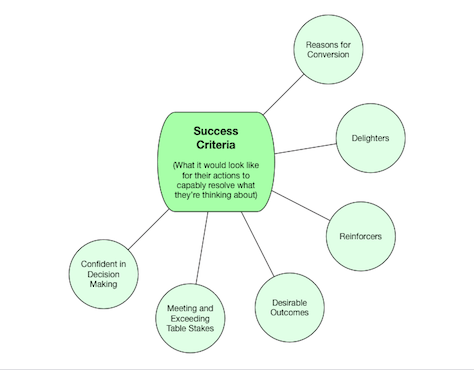 Success criteria represent a list of promises. The more your designs meet these standards, the fewer abandonments will result and the more loyalty you’ll foster. 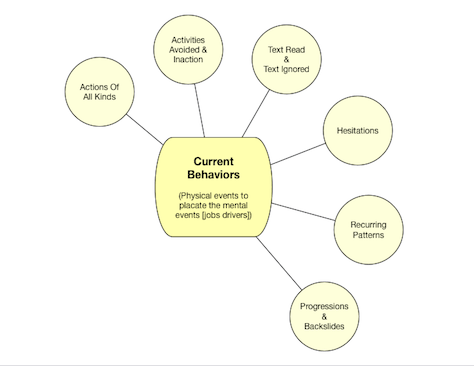 As the jobs atlas in Figure 5 shows, jobs drivers inspire the user actions under “Current Behaviors.” Current behaviors ideally lead to success criteria. However, when they lead to painpoints, obstacles, and opportunities, skilled designers must acknowledge the challenges and transform the opportunities into superior user experiences. These four simple sections of the jobs atlas are easy to describe and turn into an engaging visualization. JTBD doesn’t bring time into the equation. All that matters is that we document thought processes, behaviors, and points of friction, showing how they influence the perceived quality of an experience. The JTBD jobs atlas offers several key advantages over other generative-research deliverables. While the elements of a jobs atlas are similar to those making up a journey map or persona, these other research deliverables have some inherent weaknesses that the jobs atlas does not. Journey maps depict how motivations and behaviors can change across time, but they also falsely depict rigid linearity. This oversimplification can cause a form of tunnel vision that fails to account for the nonlinear aspects of actual experiences. In contrast, JTBD doesn’t bring time into the equation. All that matters is that we document thought processes, behaviors, and points of friction, showing how they influence the perceived quality of an experience. Personas document how motivations and behaviors can differ according to recurring clusters of traits and attributes. However, they do this by attempting to aggregate proxies that represent a holistic understanding of a supposed individual’s defining characteristics. That is an incredibly complex undertaking. 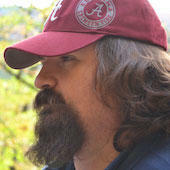 Plus, pulling insights from personas for design decision making or hypothesis creation can be very taxing. Personas require designers and product managers to become fluent in complex structures that represent a lot of attitudinal variability, then interpret how those personas might respond to a proposed experience. JTBD circumvents these layers of abstraction. Instead of starting by trying to understand the whole persona—which can be incredibly complicated and overly abstract—JTBD focuses on the desired outcome, the job to be done, which is comparatively less complicated and mostly concrete. It is noteworthy that, despite all the differences in these deliverables, the actual UX research methods underpinning JTBD do not differ from those for the creation of journey maps or personas. When developing a jobs atlas, you would still conduct contextual-inquiry interviews, think-aloud observations, and supplemental surveys, gathering data you might use as converging evidence in the same way you would elicit data in support of a journey map or set of personas. But it’s the way in which you analyze, organize, format, and present the data that really makes JTBD different and so powerful. This flexibility has made the adoption of JTBD methods much easier. The clarity and focus that JTBD has brought to our findings at The Home Depot has increasingly inspired greater hunger for UX research among our stakeholders, making it easier to ask for the resources that are necessary to adequately explore high-level, strategic questions. Both UX designers and product managers have embraced the jobs atlas. 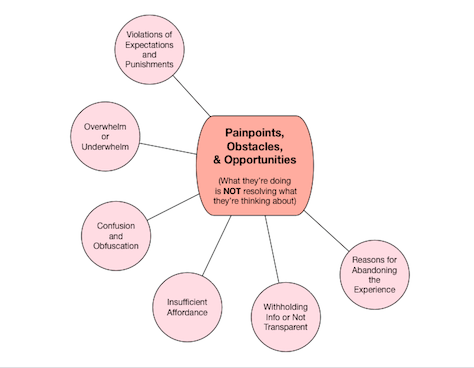 They are quick to identify answers to their Why questions in the form of jobs drivers, answers to their What questions as current behaviors, and answers or inspiration for their How questions through painpoints, obstacles, opportunities, and success criteria. Christensen, Clayton M., Taddy Hall, Karen Dillon, and David S. Duncan. “Know Your Customers’ Jobs to be Done.” Harvard Business Review, September 2016. Wunker, Stephen, Jessica Wattman, and David Farber. Jobs to Be Done: A Roadmap for Customer-Centered Innovation. New York: AMACOM, 2016. Ulwick, Anthony W. Jobs to Be Done: Theory to Practice. New York: Idea Bite Press, 2016. Great article. It really breaks down how you can take user research and make it actionable. I can’t read some of the Atlas image (Figure 5). Can you point me toward the original? Absolutely, if you find me on LinkedIn that might be the best way to send you the original graphic. I made it myself and therefore take full responsibility for its lack of legibility, hahaha.